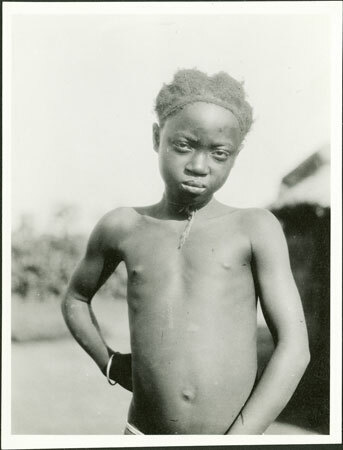 A portrait of a girl with braided hair (identified as a daughter of Prince Ngindö) wearing a bracelet, necklet and waist string, with her arm on her hip. The prince's name is elsewhere recorded as Ngindö and so I have retained this spelling for the sake of consistency. Morton, Chris. "A Zande princess" Southern Sudan Project (in development). 03 Jan. 2006. Pitt Rivers Museum. <http://southernsudan.prm.ox.ac.uk/details/1998.341.346.2/>.